A photo of Jimmy "The Eraser" Kendall, a member of the Witness Protection Program, appears in the newspaper. MacGyver finds Jimmy at a ballpark just before the mobsters arrive there to kill him. The mobsters kidnap Jimmy's daughter and grandson, and Jimmy goes to meet them at a cannery to settle things once and for all. MacGyver pulls off a pretty sweet maneuver at the baseball stadium. As the bad guys give chase, he takes a fire hose and throws it over a cable, turning it into a zip line. Then he and Jimmy ride down the zip line and land on the dugout, and then they dodge a few bullets and run out of there. I'm a big fan of zip lines. Shameless plug alert! 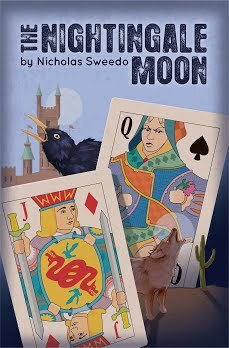 If you like slightly unrealistic zip lines as much as I do, you may like some scenes from my book, The Nightingale Moon! I mentioned in last week's write up how much I loathe Ralph. Martin Luther King Jr. once said, "Let no man pull you so low as to hate him." Well, let's just say Ralph is testing me here. What's my problem? I think I need to take a trip to the MacGyver Therapy Couch for this one. Time to lie back, get comfortable, and let it all out. Me: The scene where MacGyver gets shot by Ralph. I always HATED it as a kid. Therapist: All right, let's talk about it. Why did you hate it? Me: I didn't like seeing MacGyver in pain. Therapist: Well, this isn't the only time MacGyver is in pain. Apart from getting shot numerous times, he's gotten thrown off a parking garage, stepped in a bear trap, been hit by a flame thrower, lost his vision in a boat explosion, burned his hands badly. I could go on and on. Me: Believe me, I don't like any of those scenes either. Therapist: But it seems like there's something about this scene that bothers you more than the others. Me: It's true. At least of all the times that MacGyver gets shot, this is my least favorite time. Therapist: Do you have a most favorite time? Me: No! I didn't mean it like that. Therapist: So what's different about this one? Me: It's just that MacGyver not only gets shot, but he gets beat up pretty good by Ralph. 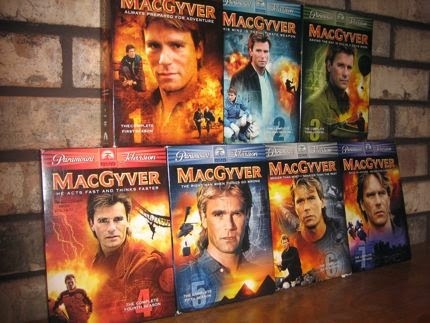 Therapist: Well, it's not the first or last time MacGyver gets beat up. Me: I know, but it looks like he's never fought before. He gives the weakest little kick I've ever seen. And I hate the image of MacGyver's high tops in the water after he gets shot. Therapist: What else? What about Ralph bothers you? Me: It's just...It's just...he's pretty weak as far as MacGyver villains are concerned. Therapist: Say more about that. Me: He just seems pretty dumb. He's not overly big and strong. MacGyver has dealt with way tougher villains before. How can he let a pansy like Ralph just do him like that? Therapist: Ah, ok, now we're getting somewhere. So you don't respect Ralph as a villain? Me: No, I don't. And then while MacGyver is in the water, he just takes his gun out and shoots him. Nobody ever just shoots MacGyver. They always talk about it, but they never do. Therapist: Well then, maybe Ralph isn't as bad at villiany as you think. Me: Sigh. Maybe not. Is this supposed to make me feel better? Therapist: Well, does MacGyver get Ralph in the end? Me: Yes, he throws a spear at a boiler and Ralph gets hot steam sprayed in his face. Therapist: Doesn't that make you feel better? Me: A little, I guess. It's a bit quick and anti-climactic. I do feel better getting this all off my chest. And one other thing. Me: The whole scene wasn't quite as bad as I thought. I didn't enjoy it, but it was over before I knew it. It wasn't worth the dread I felt leading up to it. Therapist: So we learned something about ourselves today? I like the scene in the beginning where MacGyver acts sheepishly around his attractive neighbor. Also this is the first episode in the series involving the houseboat. Pete says, "If Papa Chuck Banning and his syndicate buddies see this, after all the information Jimmy gave the government..." and later MacGyver says, "You gave testimony. You hurt the family." How much could his testimony have hurt the family? It seems like the family is doing just fine. So Jimmy's Witness Protection Program identity is as a Triple-A baseball coach an hour away? Doesn't make a lot of sense. But it's like my Mom says when I would ask why don't they just shoot MacGyver, "Because then there wouldn't be a show." The baseball scenes take place in a big stadium, BC Place, which according to its Wikipedia page has seen visits by Pope John Paul II, Princes Diana, and the Olympic Opening Ceremonies. No mention of MacGyver, however. Not yet, anyway. Speaking of the baseball scenes, it's fun to see Hank Aaron, though the whole sequence is goofy as Hank appears out of nowhere to take batting practice in an empty stadium. Hank hits a home run on the first pitch from the overwhelmed pitcher, while some of his teammates are cheering for Hank and others are playing in the field (there's even a catcher). Jimmy pumps up the kid and then the kid strikes out the legendary slugger. Poor Hank - never saw it coming. As a kid, I remember feeling badly for the grandson (who was my age at the time) who didn't play in the baseball game because his coach wouldn't put him in. Somehow, I feel worse for him about this than for getting kidnapped. The character of the undercover priest is interesting. So there's this guy who springs into action at a moment's notice with a fake Roman collar ready to hand out firearms in the confessional. And yet he's not savvy enough to know the importance of genuflecting to maintain his cover. 35:19 mark - scene from the opening credits (extended version) where MacGyver slides down what looks to me like an Indian headdress. When Jimmy runs away with his family, why do they go into the abandoned cannery as opposed to getting in his car and driving away? Clearly there are some things about this episode that I don't care for. But it's my issues, not necessarily things that are wrong with the episode. For now, I'm just glad it's over, and I'm looking forward to turning the page on Ralph and Jimmy "The Eraser". I always thought MacGyver hit the sweet spot tone-wise in Season 3, where the threat levels were stepped up, the villains were more sinister, and the suspense level escalated, albeit without the preachiness of so many of the episodes in the later seasons. This episode always struck me as pretty intense and suspenseful as a boy, particularly compared to the lighter-hearted "The Eraser". And even though it featured two of the most hapless wiseguys in mob history, I was into this one from the get-go, with the highlight being Jimmy's coded language to his "priest" leading to the passing of a gun through the church confessional window. Jimmy's grandson was a pretty bad actor, but the scenes with him were still pretty good, and everything that happened at the canning factory was pretty intense. I narrowly rated "The Eraser" better than this one but the gap has narrowed with subsequent viewings. I ranked this one #75. I regret to inform that Frank finally got Jimmy. Joe Santos is dead at 84. I saw that -- sad news. I liked this episode because it showcased Macgyver as a badass. He gets gut shot wild in the river. He climbs out of the river and takes on two mafioso with a lead pipe all with a gut shot.